Ever since Donald Trump’s election, we have seen companies stake their claim as pro or anti-Trump and his policies, whether purposefully or by accident. Among others, Nordstrom, Uber, Under Armour, and the ACLU have all received press for their statements or positions on Trump’s policies, often to great accolades or scorn. The reactions from companies have been varied as well; some have embraced the attention and tried to harness the free publicity, while others have reacted to the newly administered pressure and tried to avoid, or mitigate, the wave of angry consumers from either side of the political spectrum. Media attention to a few of these cases has been sustained (Uber, Nordstrom) while other actions have received passing attention (ACLU donations, magazine and newspaper subscription increases). But, regardless of the level of attention, are people really changing their buying or giving habits? We hear reports that about 200,000 people deleted their Uber app and donations to the ACLU are increasing significantly, but how real is this movement in consumer behavior? Since these companies aren’t about to let us peek into their books, we decided to take matters into our own hands and conducted a survey of 1,000 adults nationwide to ask them about their views on the economy and potential alterations in their consumer behavior. We were expecting to see movement, but we were shocked at the level of change shown in the data. As we discussed in an earlier piece, the overall view on the current economy has not shifted much since last year. However, the U.S. Presidential election in November did have a clear effect on how Americans view the future. In fact, the most substantial change in opinion over the last five months concerns Americans’ feelings about how the U.S. economy will do over the next few years. As a result of Donald Trump’s unexpected win in the 2016 Presidential election, his supporters are much more optimistic about the future of the United States’ economy than they were prior to the election. Conversely, Clinton supporters have moved in the opposite direction. It's not surprising that Clinton voters have little faith in the new President or that back in October before the election, Trump’s supporters saw their own status and the economy as lagging. However, it was a bit of a surprise that Trump’s supporters not only have high expectations for his presidency, but they also view their own economic situation in a different light than they did prior to the election – even though little has probably changed in their daily lives given the short time since Trump took office. Even with this new economic perception as a backdrop, we were still surprised by the high number of Americans who have changed their economic behavior since last November. Indeed, 19% of American adults – which translates to roughly 47 million people – say their spending habits have changed. But what should be of even bigger concern for companies is that half of this cohort – roughly 23.5 million people – say they are now buying from direct competitors of the companies they feel do not align with their own ideals anymore. Additionally, over one third (36%) say they have stopped spending money at a certain company and instead have given that money to a non-profit that focuses on an issue important to them. In total, 12% of adults have become what we refer to as Pocketbook Activists. At close to 30 million Americans, this group represents about $1.6 trillion in total annual spending according the Bureau of Labor Statistics. While these shifts most likely represent a small proportion of their total spending, if just 1% of their spending shifts from one company to another or to a non-profit, companies are going to notice. These are clearly interesting times; companies and non-profits alike would be well served to factor in these new consumer trends as they move forward. Pocketbook Activists are here and they are keeping a close eye on what companies are doing and saying. According to our poll, nearly 1 in 5 Americans have changed their spending habits since the November election. Surprisingly, this large number (19% of all adults) does not differ by income level, as households making over and under $100,000 show almost identical answers. There is also minimal difference by gender, although women are slightly more likely to have altered their habits (20%) than men (18%). We did find some separation by gender for those under 45 years old, as a quarter of women in this age bracket changed their spending, compared to 18% of men under 45. There were also very small differences among those that identify as liberal or conservative, just about 23% of each group. Given the changes in views that people have when it comes to their own personal economy, it was not surprising to see that partisanship did have an effect on the results to this question. Democrats are more likely to have answered affirmatively (25%) than Republicans (18%) and Independents (14%). These numbers are similar when we look at those who voted for Clinton (26% have changed their spending) and those who voted for Trump (16%). Not surprisingly, those who did not vote in 2016 are less likely to have changed their habits (12%). Stark differences also appear for those under and over the age of 65. Slightly more than one in five Americans under 65 years of age (21%) report changed habits, whereas only 9% of those 65 and older said the same. In addition to shifting spending from one company to another, 36% of those who have changed their behavior report taking money they would have spent at one company and giving that money to a non-profit instead. There is a good deal of overlap between these two actions (71% of those who have shifted money to a non-profit also reported about shifting spending between competitors) but overall, 12% of Americans have done at least one of these things since the election in November. Given the spending power this group represents, we felt it was vital to begin the process of understanding just how this pocketbook activism is manifesting itself. There are two types of changes we tested in terms of product purchases: the first is moving your purchase from one company to a direct competitor, and the other is taking that money and moving it from one company and giving that money to a non-profit instead. 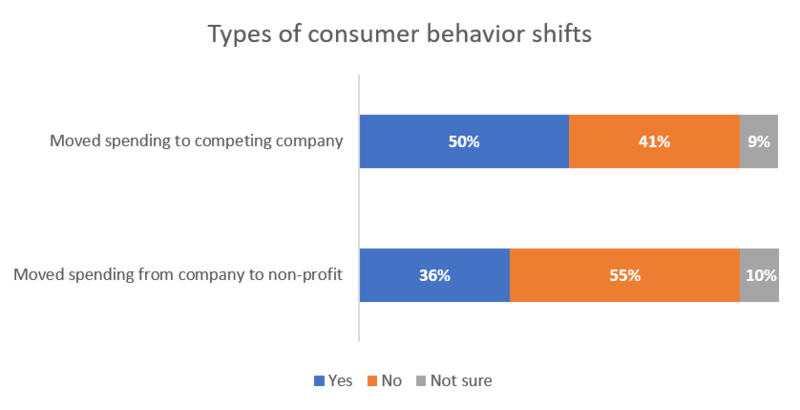 Fully, 50% of those who have changed their behaviors (or 10% of all US adults) stated they have stopped spending money at one company and have moved that spending to a competitor. With this group, we see a difference when it comes to demographics; for example, women are more likely to switch their spending to another company than men are (54% to 45%). But, interestingly, these figures aren’t just a liberal or Democratic phenomenon, as it is sometimes played in the media. The number rises to 70% among self-identifying Republican or conservative women – that’s over 20 percentage points higher than among Democratic and liberal women. But even these numbers get a little less clear-cut when you look at their voting habits: indeed, 11% of the Republican women who are Pocketbook Activists voted for Clinton. Another large variation occurs by income levels and ethnicity. Two-thirds of this group that live in households making over $100,000 (66%) report moving their purchasing from one company to another, whereas only 48% of those making less than $100,000 said the same. This may not be totally surprising, as those that live in wealthier areas tend to have more options to shop and dine, as well as simply having more money to shift around. Looking at ethnicity, African American and Latino Americans are less likely to have switched money from a company to another company. About one-third of African Americans (32%) report making this change, as do nearly half of Latinos (45%). Both these rates are lower than among white respondents, 56% of whom responded yes to this question. When it comes to those who have moved disposable income from a specific company and given that money to a non-profit instead, we also see some interesting differences. Overall, 36% of those who have changed habits report taking this action, which equates to about 7% of Americans overall. Women are more likely than men to have expressed this behavior (40% overall versus 30%). However, unlike switching between companies, we see that those under 45 years of age are more likely than those older to move money to a non-profit: 42% of those under 45 report participating in this behavior, compared to 30% of those over 65 and 31% of Americans between 45 and 65. In terms of responses by ethnicity, we found that white respondents were less likely to move their money to non-profits than minority respondents (32% to 39%). Hispanic respondents and minority women overall were especially more likely to have responded yes to this question (47% and 51%, respectively). Differences in this behavior also exist when we look at Americans with or without a college degree (30% for non-college versus 43% for college grads). College educated women show especially strong numbers here, as 50% report that they have made this change. We also see a difference in income level, where those making more than $100,000 are more likely to shift their money than those in households making less (49% versus 33%). These two monetary choices have clear similarities in their nature, so it is not surprising that there is a good deal over overlap between those that have done both. Of those who have moved money to a competing company, 51% report also moving money from a company to a non-profit. On the reverse, 71% of those who have shifted their money to a non-profit have also shifted their spending to a competitor. Overall, this translates to 5% of Americans have both shifted money from one company to a competitor and moved spending from a company to a non-profit. An additional 5% have supported a competitor, but have not shifted money to a non-profit, and 2% of Americans have shifted money to a non-profit but have not shifted money to a competing company. In total, 12% of Americans have taken one of these two actions since the election. This cohort that we are calling Pocketbook Activists is clearly an interesting group to keep an eye on and will be key for companies looking to make their way through this new landscape. That being said, there are two ways this behavior can manifest itself, either you are moving away from a company that does not match with your values or you can move money toward a company that does. We asked all respondents which they were more likely to do. Overall, Americans lean toward the positive in terms of supporting companies that align with their values. About one third (32%) of Americans are more likely to take positive action, while 15% are more likely to act on the negative (18% say they are likely to do both equally). Interestingly, this sentiment is switched among Pocketbook Activists. Thirty (30) percent of Pocketbook Activists are more likely to move purchases away from a company, while 25% report being more likely to move money towards a company. The largest group, however, are the 35% who are very likely to do both. The gender split also shows some interesting differences. Overall, men are slightly more likely than women to act on the negative (17% versus 13%, respectively), while the numbers of those who are very likely to both are almost identical (18% of men and 19% of women). Among the Pocketbook Activists, men are again more likely to act on the negative (34% compared to 27% of women), while women are much more likely to do both equally (41%) than are men (29%). Household income also shows some major differences. Among all Americans, those that are in households that make $100,000 or more are more likely to act in the negative than those in households that make less (20% versus 14%), while the numbers are similar on those more likely to act in the positive (34% and 33%). Those in higher income households are also more likely to do both equally (25% to 18%). Among the Pocketbook Activists, 33% of those in households making less than $100,000 are more likely to act on the negative, 25% in the positive, and 31% are very likely to do both. Among those in higher income households, 16% are more likely to act on the negative, 29% on the positive, and 50% are very likely to do both. As mentioned above, the additional income frees up people to make different decisions but, even with this in mind, these differences are telling. Besides the difference in overall actions, the Pocketbook Activists also have different opinions on specific examples of CEO behavior. We asked all respondents about a few of the bigger stories in the news recently when it comes to CEOs making comments in support or opposition to the President. Given the actions they have taken, it is not surprising that the views of Pocketbook Activists are stronger than that of the average American. When asked if they would be more or less likely to use Uber after the CEO announced that they would lift the surge pricing and send Uber cars to airports during the initial round of protests of Trump’s travel ban (cab companies in New York had announced that they would not send cabs to pick up passengers in support of the protests), the answers were mixed overall. Eighteen (18) percent of Americans said they would be more likely to use Uber, while 15% said they were less likely to use the rideshare app, and 16% said it would make no difference – the rest have never used the service or were not sure on their answer. Among the Pocketbook Activists, the response was similarly split but at a heightened level. Among this key cohort, 34% said they would be more likely to use Uber, while 31% said they would be less likely. Not surprisingly, the responses to this question were motivated by partisanship, with 70% of Trump-supporting Pocketbook Activists saying they were more likely to use Uber, compared to just 13% of Clinton supporters in this group who said the same. Interestingly, when we asked Americans about their views on Uber and Lyft, there is a lower positive view of Lyft – but that number jumps way up among Pocketbook Activists. Overall, 33% of Americans view Lyft favorably, while 17% have a negative view. The positive is slightly higher for Uber (39%), but 29% have a negative view of the ride share company, which is 12 points higher than Lyft. Among Pocketbook Activists, the favorable view moves even closer, with 53% viewing Uber favorably and 51% feeling the same about Lyft. At the same time, the negative views barely change, with 30% of Pocketbook Activists having a negative view of Uber and 17% feel the same way about Lyft. Starbucks CEO Howard Schultz announced that they would hire 10,000 refugees in response to Trump’s initial travel ban and a “Boycott Starbucks” effort was launched. Overall, 25% of Americans said they would be more likely to go to Starbucks based on this announcement, while 17% said they would be less likely, and 19% said it would make no difference. However, among the Pocketbook Activists, 47% said they would be more likely to go to Starbucks, while 20% said less likely, and 13% said they would use them regardless. As we showed in our infographic earlier this month, Americans love their coffee and a majority of Americans (54%) have a favorable view of the Seattle-based company. At the same time, 29% have an unfavorable view of Starbucks and the divisions on these views are both partisan in nature as well as based on ethnicity – African Americans and Hispanics have a much more positive view of Starbucks than white Americans. Among the Pocketbook Activists, 63% have a positive view of Starbucks, while 29% view them unfavorably. Unfortunately, we do not have data on the question from before the election to see how (or if) the numbers moved. When it comes to clothing companies, comments from Under Armour CEO Kevin Plank praising Trump are viewed much more negatively than Nordstrom’s decision to stop carrying Ivanka Trump’s line of clothing. Overall, 18% of Americans say they are more likely to buy Under Armour based on Plank’s comments, while 15% are less likely. Among Pocketbook Activists, 30% are more likely to buy Under Armour and 31% are less likely, while 10% say it won’t affect their buying of the company’s products. Given the split on Under Armour, we would have expected something similar when we asked about Nordstrom. However, when it comes to the higher end retailor, 23% of Americans say they are more likely to shop at Nordstrom while 14% are less likely. Among Pocketbook Activists, a majority (51%) say they are more likely to purchase products at Nordstrom, while just 15% say they are less likely. What is also interesting with these numbers is that 45% of Americans view the retailer in a positive light while just 21% have a negative view. Among the Pocketbook Activists, that positive number jumps to 60% while the negative view stays at a similar 20%. For Under Armour, there is a noticeable increase in both directions among the Pocketbook Activists; 55% of Americans have a favorable view of Under Armour while 12% have a negative view. Among the Pocketbook Activists, the favorable are 7 points higher, and the negative perception is 10 points higher. The potential changes in purchasing habits should get the attention of CEOs and corporate boards; however, how to deal with this new reality is a little less clear cut. Overall, a majority of Americans (56%) would prefer if CEOs kept their political views to themselves, while just 22% would like to hear where they stand. Additionally, 22% are unsure about this question. While there is some small variation among different demographic groups on this subject, the number of people who like activist CEOs remains small for the most part, with the exception of the Pocketbook Activists. Among this group, 48% would prefer CEOs express their political views, while 50% would prefer if they stayed out. Just 2% of this cohort is unsure. This is clearly a hyper-opinionated group and it will be tough for CEOs to navigate these uncharted territories unscathed. It is not news to say that we are living in some interesting times. And while President Trump’s election was a surprise to most, the changes we have seen since the election are unique. In the past, we have seen some examples of consumer behavior changes such as an increase in gun sales when a Democrat was elected President. However, the overall effect of Presidential elections tended to be minimal when it came to most economic behaviors. In November of 2015, Erik Kobayashi-Solomon wrote a piece in the Chicago Booth Review discussing how U.S. elections don’t drive consumer spending. This theory now may be in question based on our data. It will take some time to fully understand the effects of these behaviors and how meaningful they are to corporate bottom lines. Opinions on personal behavior often don’t meet reality (we all report eating much healthier and exercising a lot more than in reality). What we do know is that Americans are clearly paying attention to the words and actions of visible CEOs and making decisions based on what they hear and it is also clear that Americans would prefer for companies to not be vocal in the political space. Certainly, CEOs and corporate boards will need to think about how they are dealing with this new reality. These are interesting times indeed. For a PDF version of this memo, please click here.